We were having a bit of a sweets overload in my house so we decided to balance it out with some meat, or in this case, a brick of meat. I always thought of meatloaf as a solid hunk of meat covered in a ketchup sauce. This Italian version breaks the meat in half with a layer of cottage cheese and mushrooms and doesn’t have sauce on top. 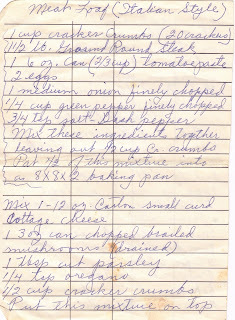 It’s an interesting flavor, but sadly, this is the first recipe in the box that we haven’t been crazy about. Maybe it was just the post-long-holiday-weekend blues, but it was a mediocre meal compared to everything else we’ve tasted. Murphy, on the other hand, was a huge fan. If you could measure an approval rating by the length of drool hanging from a dog’s mouth, this one would be off the charts. And Murphy doesn’t drool for just anything. His two favorites are tacos and brats. And now Italian-style meatloaf can be added to that list. I debated whether or not to post the pictures of this one because, honestly, it looks really gross. I tried to think of a way to decorate the plate to make it more appealing, but there’s just no way to dress up meatloaf. Trust me, it tastes better than it looks. 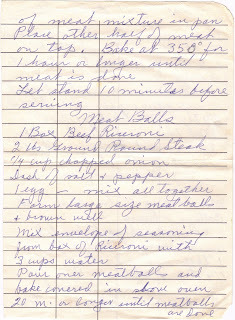 There was also a meatballs recipe on the bottom of the card, but we consumed enough beef for a while so I didn’t make that one. Now, I think it’s time for more sweets! It sounded good when I first started reading your post. Went to see Julie & Julia last weekend. Thought of you.